Canon inkprinter without ink absorber (running full). Discussion in 'Canon InkJet Printers' started by Hugorm, Nov 2, 2018. 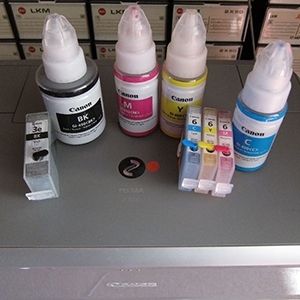 Do anyone know a Canon ink printer which to not have the risk of ink absorber running nearly full? Do any one know any inkjet printer which can do more than 10 K A4 picture printouts without systematic errors? Inkjet printers have counters to keep track of waste ink that is drained onto waste ink pads (diapers or absorbers). These counters eventual reach "full" and an error message is displayed and you will not be able to continue to print until the counter is reset back to zero. This resetting can be done by Canon repair shops for a cost or you may be able to find a Service Mode Tool that allows you to do it yourself, maybe for free. However, not all new printers allow you to enter Service Mode to use the tool, at least that is known currently. To reiterate: Without resetting the waste ink counter you will have an unusable printer. As for the "full" ink waste pads, you may be able to keep using them without replacing or cleaning them for ONE reset of the counter without ink leaking. The forum consensus, weak that it is due to little experience, is the risk is low for leaking in this scenario. You might consider placing a tray or something else under the printer to catch leaked ink if that were to occur. Epson printers may be fitted with something to divert waste ink away from the ink waste pads and to an external waste ink container. An example is the Printer Potty from Octoinkjet. Click on "Waste Ink Kits" at the top of their page and read the various sections for more info. Due to the complexities of the Canon printer, external waste ink containers are not a simple task to install. We are interested in what you decide and how it works out for you. If you follow the best practices reset regimen in swapping complete sets, the Canon Pro-100 is good for approx 30,000 prints (Thirty thousand prints depending on saturation and images). You'd need to learn to maintain the cartridges in good condition at all times in a production environment for that. But it is doable and is being done. On Epsons, the paper handling mechanism is likely to become unreliable before the 10K is reached. You will need to maybe consider this. I did not know this. What is the reason? Does Jose (Toolman) have a You Tube video on this? This has been a "traditional" problem on Epson rear feeds. You just need to check back on enquiries. The same design since the early 2000s to even the P800 today. If it doesn't feed at all, then it also has an issue with skewing. Quite a few Pro-1000 owners gave up on Epson for this reason. Who wants to feed an expensive sheet of fine art paper only to find that it comes out skewed? Reason....weak design relative to Canon. For starters, notice how Canon feeds from the middle of the printer. Epson is off one side. So that means the means to feed is not symmetical to start off.....that's a handicap right there. You then must rely on all conditions being perfect. With feeding from the middle like Canon, there is more leeway in how perfect the mechanism must be to get a straight feed. Also notice how the printer "grabs" the sheet and you'll come to your own conclusion. Of course I must say I have taken advantage of this situation through the years by purchasing at extremly low prices used Epsons that owners just got fed up with the feed and brought it home and "fixed" it....but only temporarily until the misfeeds begin anew. But it progressively gets worse over time. Not everyone can do this or put up with it. However, on Canons this never happens. Of course YMMV but there is a pattern and you can confirm the pattern. palombian, The Hat and stratman like this. Thank you for the explanation! I was thinking maybe the rubber rollers or some such dried and needed reconditioning. Most curious Epson would not correct this well known design flaw, except that it makes sure to have customers purchasing more often otherwise. I’ve decided to stay with Canon ink printer. - Not able to find any without waste-counter. - Able to zero absorber counter of my MG7550. So far I’ve found MG7550 responding to ‘normal’ service mode ‘MG’-setting (6 times). Version 5204 may not be intended for MG7550, it CAN set the absorber counter to zero! When choosing ‘Test Print’ the output shows the counter value and after using ‘Ink Absorber Counter’ ‘0’ set a printout shows absorber counter = 0. Thank you for the follow up information. Congratulations!